Eventbrite has updated its Easy Entry iPhone app with a smart feature: barcode scanning. People have become more accustomed to having ticket collectors scan their tickets, so scanning of a barcode on a printed out Eventbrite ticket makes complete sense and will help to move entry lines faster. 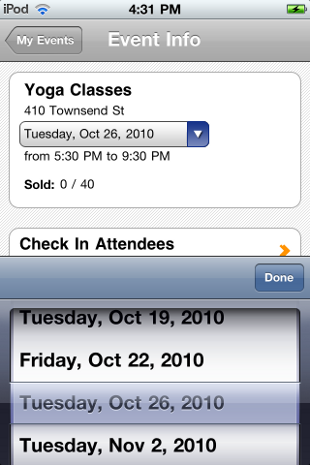 The new version of the app also displays the attendee’s email, ticket type (i.e. student, press, etc) and payment method under the attendee’s name once they have been checked in. Also, organizers can still look up attendees through the app through searching names or by scanning a list (which is how the previous app worked), and the app also offers settings for repeating events. One of the main advantages to this app, according to Eventbrite, is that unlike more traditional event scanners, if there are multiple ticker collectors/scanners at the door, the Eventbrite app syncs all of the attendee arrivals from each phone/iPod Touch into the organizer’s central Eventbrite dashboard in basically real-time. Obviously, this is more of an issue for large, paying events then for the multitude of smaller, often free, events that Eventbrite also serves, but if you use Eventbrite, having multiple Eventbrite enabled devices that sync is helpful, regardless of what other technologies exist. In addition to the iPhone app, Eventbrite is also rolling out a browser-based event check-in screen, called “Eventbrite Entry Management” – which we’re assuming is like when you show up to a conference and check-in at one of the kiosks that have laptops. This is a nice small touch and one that will be appreciated among the non-iOS-toting-organizer crowd. Event-specific pages that we can use to interact with other attendees, ask questions of the organizers, etc. An attendee check-in function that allows attendees to check-in to an event when they show up and share that check-in with Foursquare, Gowalla, Facebook Places, Twitter, etc. Any way to enhance the attendee experience is always welcome (as well as with check-ins to spread the word), and we suspect that organizers would like to see an attendee app in the near future as well. For now though, Eventbrite’s new organizer app should almost certainly make getting people though the doors an easier process.